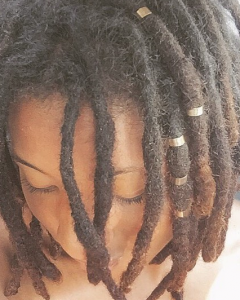 When Is It Safe To Start Wearing Loc Jewelry? With all of the different types of loc jewelry available to adorn your locs, are you aware of how loc jewelry can affect your locs? Did you know that depending on what type of loc jewelry you chose you could cause thinning, weak spots, and lumps in your locs? I’ve experienced issues with loc jewelry firsthand and I’ve seen it on many guests in the salon and I don’t want you to have to go through it. You can ensure that you’re wearing loc jewelry responsibly with these 3 tips. Loc jewelry can be worn in all types of locs, from Sisterlocks to Freeform locs, however the maturity of your locs is what matters the most. 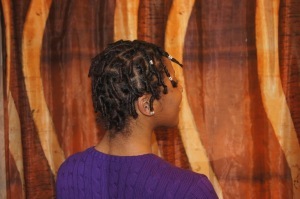 It is strongly recommended NOT to wear loc jewelry for at least the first 6 months of your loc journey. I didn’t listen to this advice and I can tell you from experience that I wish I did.Yes, loc jewelry looks great in your hair, but it actually prohibits your locs from collecting the shed hair and forming a solid internal matrix. The results of wearing loc jewelry too soon, before your locs are mature, include weak spots, bumps, and indentations in the lock. Yes and No— There are both permanent and temporary loc jewelry options available. “Permanent” loc jewelry is typically attached to your locs by threading so that it would have to be intentionally removed. With permanent loc jewelry you’re able to wear it when you shower and retwist/retightening your locs. 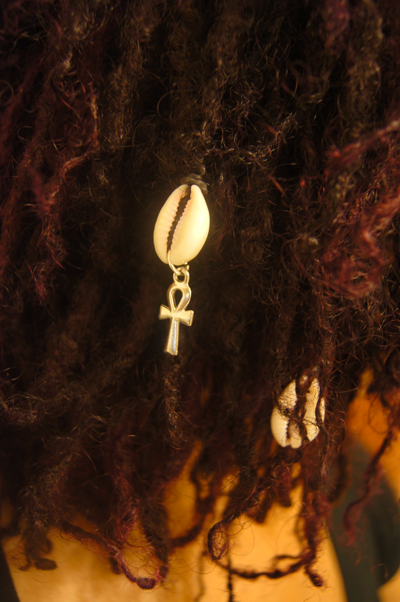 However, options for permanent loc jewelry are limited if you maintain your locs with interlocking, such as Sisterlocks, because you have to pass the entire loc through the roots, which can be hard with an Ankh Shell on the end. A more common option is temporary loc jewelry which you can easily remove and reattach at your leisure. This option is great if you frequently shampoo your locs and don’t want to tarnish the loc jewelry or if you like to alternate which locs are adorned. 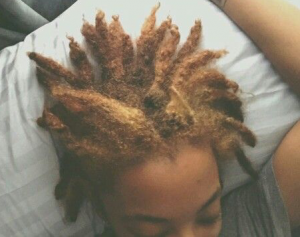 Just like on your fingers, copper, silver, and even some gold jewelry can turn your locs green. This green ring is a chemical reaction between the pH of your hair and the hair products causing the metals to oxide and produce tarnish. 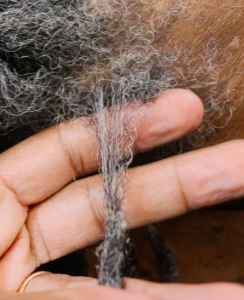 The best way to avoid creating a green ring around your locs is to remove the jewelry before shampooing or applying any products to your hair. You can also opt to use only stainless steel loc jewelry in your locs, but these options are pretty limited. 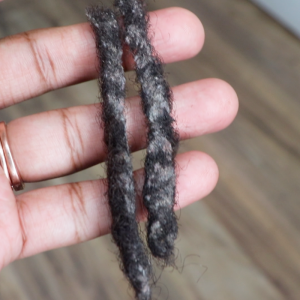 Funny story— While adorning my locs, I chose not to take the loc jewelry out my locs and after weeks of wearing the cuffs, I discovered the green rings underneath of my loc jewelry. Naturally I panicked, but after several shampoos the green tarnish washed out completeled. LESSON LEARNED! So, before you start buying and wearing loc jewelry, make sure you consider how mature your locs are, how you plan to maintain your locs (interlocking or palm-roll), and what kind of jewelry your skin and hair might react to. 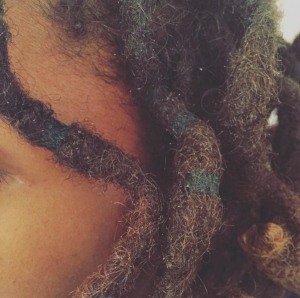 Will you think twice before wearing loc jewelry now? Thanks so much! Didn’t know about loc jewelry and interlocking. Great information. I had learned about Being careful about wearing loc jewelry in you locs when in the developing stages of growth when researching pre-BC. I’d actually heard it’s better to wait a full year before starting! So I’m patiently (mostly) waiting, at my3-day-shy-of-8-month locaversary stage, for the big 1year anniversary to reward myself and mark the milestone with my first piece of loc jewelry! Every time I see a beautiful one on line, I bookmark it! Thanks for tips on temporary can permanent pieces, and also about that green metal ring – YIKES! Great post. I started using loc journey probably at month 8. I didn’t even think about the green ring that could possible form and I do keep my jewlery in when I wash. I will be removing my jewlery when I get home to check!! Thanks for the info.